Below, watch a teaser for the second season of AMC‘s Into the Badlands TV show. While the cable network has not yet announced an exact premiere date, season two will kick off in spring of 2017. 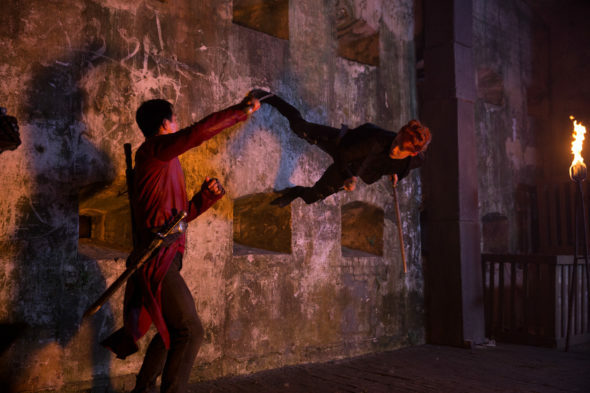 A futuristic martial arts drama, Into the Badlands stars Daniel Wu as Sunny and Marton Csokas as Quinn. Aramis Knight, Oliver Stark, Emily Beecham, Orla Brady, Sarah Bolger, Ally Ioannides, and Madeleine Mantock also star. What do you think? Have you watched the first season of Into the Badlands? Will you check out season two on AMC? Tell us. YES!!!! love this show. very different!!!! !